Performing dissimilar metals welding is a common occurrence, especially when dealing with applications where advanced alloys are needed due to the mechanical, physical or corrosion properties that the components will need to exhibit. Due to economic factors, different metals give optimum performance in different parts of a system. They do however need to be joined to each other. When welding is the best joining technique, then our dissimilar metals welding problem raises its head. 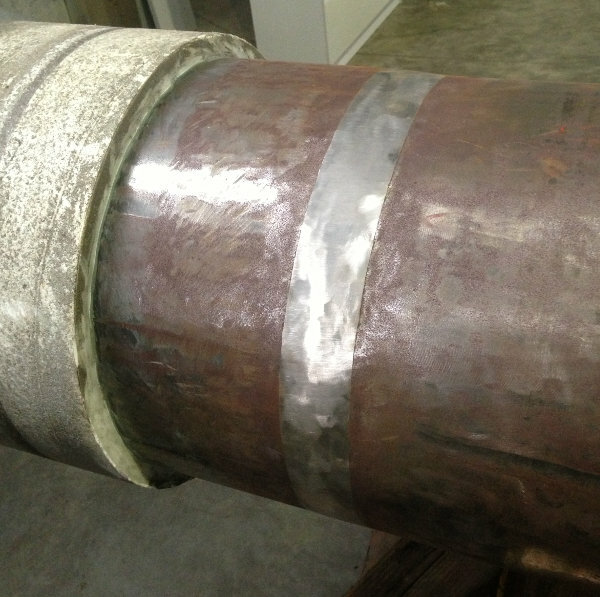 Carbon Steel Pipe With Stainless Steel Internal Cladding - Welded With Nickel Based Filler - The Surface is Ground Smooth to Assist Ultrasonic Testing. That the weld metal composition formed is stable from a metallurgical point of view: Some metal compositions will form brittle intermetallic phases, or some metals will quite simply not mix. Obviously such compositions are to be avoided. The simplest way of avoiding this is to use combinations that have been used successfully before. This can simply be done by looking up suitable filler metals for different base metal combinations from existing tables. These are freely available on the internet from most filler metal suppliers. See Figure 1 below for an example recommended filler metal table from "Special Metals". Figure 1: Dissimilar metals welding recommended filler table. 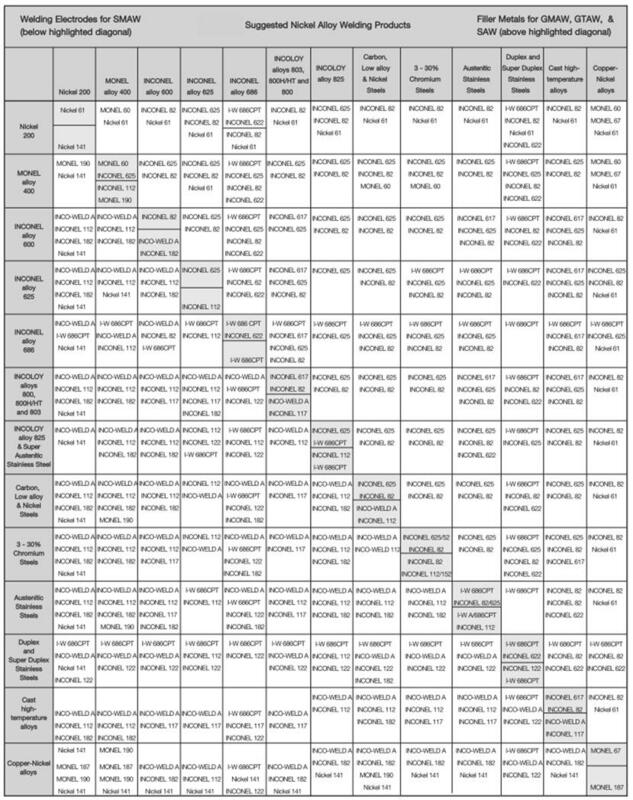 This table comes from a "Special Metals" catalogue. They produce the industry standard "Inconel" branded nickel based filler metals, hence the emphasis on these consumables in the table. Figure 2: Schaeffler Diagram - Used in dissimilar metals welding to predict the weld metal composition and properties. Any possible difficulties we may have during the welding process: Certain types of weld metal may pose different challenges during the welding process. So for instance, a 100% austenitic weld metal is prone to suffer hot cracking, while a martensitic weld metal is prone to be brittle and suffer from hydrogen assisted cold cracking. (HACC) By understanding the composition and structure of the weld metal, we can try to prevent any such problems. Once again, the Schaeffler diagram comes in handy for this purpose. 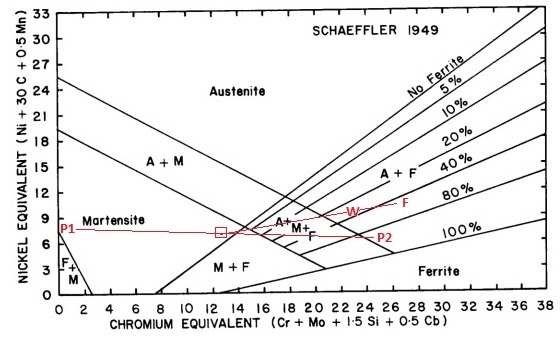 To most easily explain the use of the Schaeffler diagram for dissimilar metals welding, I will explain the use and show it as an example at the same time. Using a duplex stainless steel filler: Designated "Filler metal" with a chemical composition of: C:0.02%; Si:0.5%; Mn:1.5%; Cr:23%; Mo:3%; Ni:9%. - Note that this filler metal is not listed in the "Inconel" table above, but is often used when joining these materials. The point W on the diagram below is then the anticipated composition of the weld metal. Its location on the diagram also gives an indication of the microstructure that is anticipated, as well as how sensitive it is to dilution. In this case we see that it will be between 20 – 40% ferrite with the rest austenite. Because point W is relatively close to the austenite + martensite + ferrite line, we can see that it is relatively sensitive to dilution from the parent metal, so we would have an instruction on the welding procedure that low dilution welding techniques are to be used. 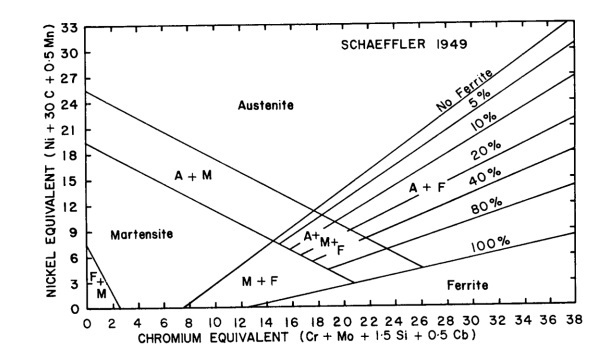 The Schaeffler diagram is not very accurate for modern duplex stainless steel parent metals, because it does not take account of the effect of Nitrogen as an alloying element. It is however accurate enough for our purposes because the welding filler metals and weld metals are low in Nitrogen, so their positions are more accurate for weld metals than the parent metals. An Excel spreadsheet is available for performing these calculations automatically. This spreadsheet is freely available when you sign up to receive the free WelderDestiny newsletter. The spreadsheet also allows calculations to be performed for overlay welding. Click on the prominently displayed subscribe button to sign up for the newsletter. The fact that there is going to be quite a bit of ferrite in the weld metal (Around 20 - 40%) means that it will not be very sensitive to hot cracking. We will look at these issues in future web pages.